It is an understatement to say that the students at Nay Ah Shing are inspiring. 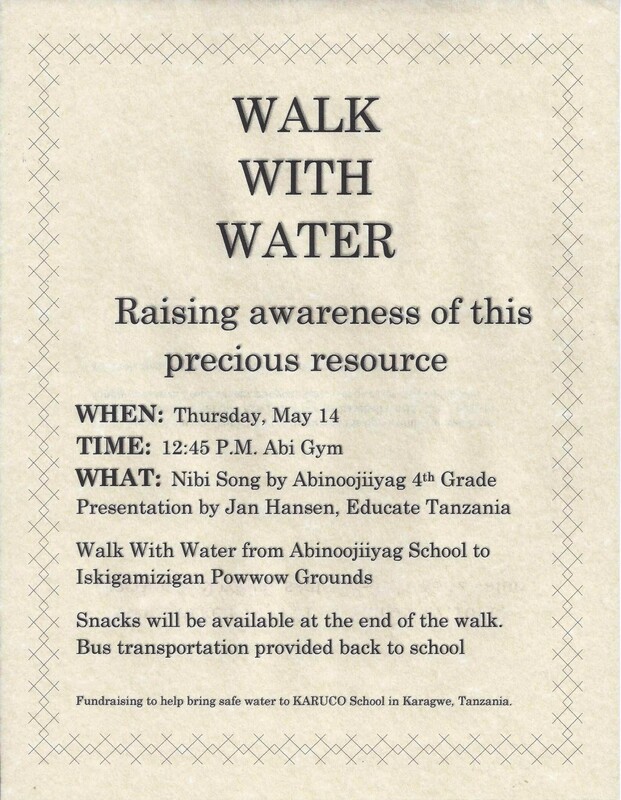 This is the second year that students will collect pledges for the Walk With Water event and then donate the money to Educate Tanzania to help bring water to KARUCO. Nay Ah Shing takes their stewardship of water seriously and wants to help those who have no access. Do you want to help? It’s as easy as clicking “donate”. Help Educate Tanzania bring water to KARUCO. …oh yeah – and surviving. Last year, some Grade 4 and 5 students started a group called “We Make Change”. Under the guidance of teachers, Ms. Budrow, Ms. O’Hern and Mr. Rutter, they challenged the student body and staff to purchase “bricks” and raised money for KARUCO. They then planned a Walk With Water event that raised even more money for ETI and KARUCO. Nay Ah Shing was honored at the Annual ETI Dinner and Fundraiser in Chaska in 2014. The audience of 200+ was visibly moved when the story was told. Nay Ah Shing, a small Tribal school in Minnesota, where many are very poor, contributes greatly to help people in Tanzania as they work to bring themselves out of poverty.